Damian (Reynolds) examines his new body; his old one (Kingsley) is in the background in Tarsem Singh’s new film Self/less. Director Tarsem Singh makes an adjustment to Actor Sir Ben Kingsley’s costume. Actor Ryan Reynolds portrays Damian in his new body in Self/less. (L-R) Director Tarsem Singh and Actor Sir Ben Kingsley review a scene. In the story Self/less, Sir Ben Kingsley’s character Damian takes over Ryan Reynolds’ character’s body through this process of “shedding” that Albright (Goode) has created. The way the shooting schedule was structured, Reynolds and Kingsley would never have a scene together. “The caterpillar doesn’t know the butterfly,” offers Kingsley. Shooting order was important to determine what character traits Reynolds would have to mimic from Sir Ben to key the audience into the fact that these two people were indeed the same person, but things didn’t quite work out as planned. Director Tarsem Singh considers a shot composition for Self/less. “Things were supposed to be reversed, but schedules changed things around (shooting order) so it was Ryan first and then Sir Ben. So like the accent, we just didn’t know (what Sir Ben was going to do). That’s why I came up with a few particular things like the tick with the glasses or when you come home and you throw your keys in back of you onto a chair. Those types of habits I kept and focused on instead of the accents,” explains Singh. Madeline (Natalie Martinez) and daughter Anna (Jaynee-Lynne Kinchen) flee with Young Damian (Ryan Reynolds). One of the scenes that’s naturally New Orleans in Self/less is an abandoned warehouse that appears to be close to (or may be) Mardi Gras Worlds’ old location on the Westbank. 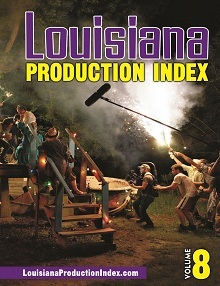 In the film you see pieces of Mardi Gras sculptures in an old abandoned warehouse. “We needed to give Damian a hint (about his new body). There’s lots of abandoned warehouses in New Orleans, but very few that are abandoned and would house these sorts of things (sculptures). We wanted to use the location (Mardi Gras World), but too many people know the real one and know that it’s not something you could house an operation like this in (Albright’s lab) even though it’s a mobile lab,” explains Singh. “I did not enjoy New Orleans, I love it! I keep thinking I’ll get a place there, but it’s got such a great rental culture that if you are going in or out, it just helps to rent the place. I shot there before, the Levi’s commercial campaign a couple of years ago. I love it …everything … and good food,” continues Singh. One of the other iconic New Orleans scenes is a party montage that will probably become a textbook case study for all aspiring filmmakers. “When I saw that we had a montage scene, and I thought, ‘Well, you basically had a few months to live but now everything has changed, and, so of course, you’re going to party, but you can’t tell anyone who you are. So where do you want to go? If you’re hedonistic, you’d go to New Orleans, and if you’re completely crazy, you’d go to Vegas. I picked New Orleans,” says Singh. Ryan Reynolds in a scene from Self/less. “The energy Tarsem brings to the set is palpable. He wields a little bit of magic, and you cannot exhaust this man. I would follow him anywhere,” concludes Reynolds. Be sure to catch Ryan Reynolds, Sir Ben Kingsley and Matthew Goode in Tarsem Singh’s Self/less which released at theaters nationwide on July 10, 2015. Want to learn more about Self/less? 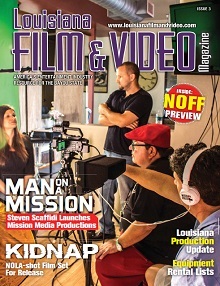 Check out Louisiana Film & Video’s production story on the film from Issue 6, 2013.